Graham MV School emerged as the first school in Hailakandi district of Assam to achieve cent per cent success in Measles Rubella vaccination. The school had vaccinated all the 150 students on its roll, drawing approbation from the district administration. At a function held to commemorate the occasion on its school premises in Hailakandi town on Saturday, Deputy Commissioner Adil Khan congratulated the teachers of the school, parents and students for ensuring 100 per cent success in MR vaccination. Khan hoped that other schools would take a leaf out of it and help in achieving cent per cent success in MR vaccination in the district. The Deputy Commissioner has asked the officials of Health, Education and Social Welfare to play proactive role to vaccine each child. He requested all private schools across the district to participate in the campaign to vaccinate every child. There are altogether 1,484 private and government schools in the district where MR vaccination campaign are going on. Khan also assured to extend all kinds of cooperation and support from the district administration to achieve 100 per cent target. A little over 2.15 lakh children have been targeted for immunization. District Immunization Officer, Dr K Thambalsena said vaccination is the only effective way to tackle the two diseases. The health authorities here have emphasized on proper micro-planning and involvement of community leaders, religious leaders, mothers and parents as ‘proper planning at grassroots level is the key to success of such mass campaign’. District media expert, Monica Das said the people need not believe any rumour about ‘side effects’ of the vaccine, as it is safe and effective. “Parents should utilize the opportunity to vaccinate their children. 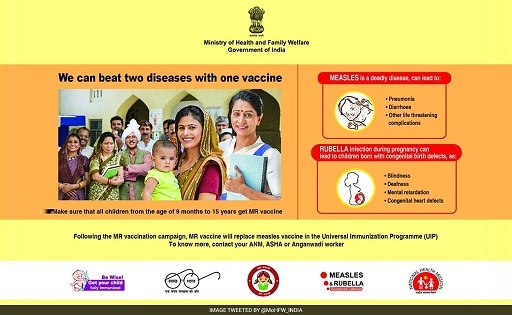 The objective of the government is to eliminate measles and congenital rubella syndrome by 2020 and build up immunity in children aged between nine months and 15 years,” said Das. The MR vaccination campaign will continue in schools till October 1 and subsequently in regular outreach and fixed session sites. Measles vaccine was being administered since 1985 under a universal immunization programme and it proved to be safe and prevented the ill-effects associated with measles virus that caused diarrhoea, pneumonia or even death among young children.